Your dentist is a health care provider, similar to your personal physician. As you know the importance of choosing the right doctor, the same is true for your dentist. Are You Looking Forward To Your Next Dental Appointment? You may be surprised to learn how many adults do not visit the dentist unless they have an emergency. In many cases, it is not because they cannot afford it, or cannot fit appointments into their schedules. Many people avoid the dentist because of bad experiences they had when they were young. From small children to elderly persons, individuals need to feel they can trust their dentists. Fear should not be a part of dental visits. When you have the right dentist, a dental appointment will not be a worrisome experience. A good dentist inspires trust and confidence in his patient. What If You Need Dental Treatment? 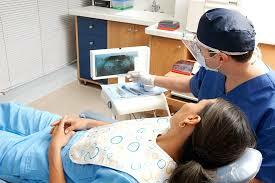 Under ideal circumstances, your experiences with dentistry will include twice-annual exams and cleanings. You will have a dental professional to answer your questions. However, choosing a dentist is also important when you need any type of dental treatment or dental work. You want a dentist who is fully qualified to treat your particular dental issue. Whether you need implants, a filling for a cavity, or root canal therapy, a dentist’s training and experience will make a difference. Your treatment can be completed without complications, and the least amount of difficulty for you. You can look at choosing a dentist the same as choosing a personal physician. When you are looking for a dentist who will meet your needs today and in the future, make an appointment to meet the dentist in person. When you see his overall attitude and professionalism helps you feel comfortable and confident, your oral health care will always be a positive experience. Thanks for sharing! It’s awesome how you mentioned about considering the overall attitude and professionalism of the dentist while choosing a specialist who makes feel comfortable and confident during visits. My elder is going to school, so I’ll definitely consider these recommendations organizing an appointment with the dentist for him. Thanks for your comment about how you should look for a dentist who is trustworthy. I like how you said that you should choose someone who makes their patients feel comfortable. My husband and I are looking into helpful dentists for our daughter since she’s nervous about having to get braces. I do like that your article mentioned how good dentists would be able to inspire trust and confidence in their patients to eliminate fear from small children to elderly persons. Knowing this is a reassuring idea to have since children nowadays tend to be scared of dentists due to their peers in school. Hopefully, we could get our twins to a kind and reputable dentist in our new place to eliminate this growing fear of theirs. Thanks! I like how you mentioned that choosing a good dentist is essential to remove the possibility of our child and ourselves to have a bad experience and avoid returning. Additionally, a good dentist is would be able to create a trusting environment which would help you and your family remove any kind of fear you might have with a dentist. This is why I’ll be sure to find a reputable, kind, professional, and trustworthy dentist in our new area to make sure that my family will be comfortable during the sessions. Hopefully, my search tomorrow will be able to go well so that we can be scheduled for a consultation. Thanks! Thank you for mentioning how you should take the time to look for a dentist that is qualified to help with your particular issues. I can see that taking the time to understand this can help you find someone that knows how to provide the dental care you need and make any corrections to it. Personally, I would also want to consult with my insurance company to make sure I choose dental services from someone that accepts my coverage and can provide the services I need to keep my teeth healthy. I appreciate you mentioning how you should take the time to meet with the dentist you want to choose in order to get the quality services you need. Personally, I would also want to make a list of services I need from a dentist that knows how to provide the professional advice I need to care for my teeth. It is important to understand that taking the time to assess your own needs and compare several dentists can help you find the best one for the type of dental needs you have. I agree that our dentist is a health care provider, similar to our personal physician. My sister moved to a new city and she needs to go see the dentist to have her braces adjusted. My mom suggested finding another dentist and shared this article with her. It says that she wants a dentist who is fully qualified to treat her particular dental issue. It’s interesting that you suggested finding a dentist that is experienced in the specific problem you are having. I have been looking for someone to help fix my son’s cavities. I can see how it would be nice to find someone that has done them before because that way I would know they have the knowledge required for the job. My wife has been wanting to find some good dentists for our family. I’m glad you talked about how you need to feel that you can trust your dentists. I’m going to have to see if we can find some dentists we can trust, and see if we can get the dental help we need! Thank you for the information on why it’s important to choose the right dentist. I like the tip to meet with the dentist in person to better gauge his professionalism and how comfortable you feel with them. Also getting referrals or recommendations from friends and family is a good starting place. Thanks for pointing out that a good dentist inspires trust and confidence in a patient. I am looking to find a dentist for my family that we would all be comfortable working with. My kids have anxieties about having their teeth checked out, so someone that can work well with children is another trait that I would look for. I agree that you need to consider if a dentist is qualified to treat your issues. It would be good to consider this because it would show that they are experienced. My sister needs a dental implant, so she’ll have to find a dentist who is experienced with this. I agree that you would want to consider if a dentist is properly qualified. It would be good to consider what kind of procedures they do in order to ensure this. My sister needs a dentist for regular checkups, so she’ll have to see if they are qualified for the job. Thanks a lot for mentioning how you should take into account your particular concerns when looking for a good dentist. It is important to remember that doing this can not only help you find a dentist that knows how to care for you, but also find someone you can trust. Personally, I would also want to check with my insurance company to make sure I choose a provider within my coverage and save money while I get quality dental care. I agree, ideally you’d want to choose a dentist that is well experienced with your particular dental issue. After all, if you’re seeking them out for help with your problem then you’ll actually want them to have the skill to help you. It might help to talk with the dentist you’re considering about your specific problem when you have an initial consultation with them. I like how you mentioned that bad experiences when one is young can affect the future of the person with their relationship with a dentist. That is something I would keep in mind so that my twins wouldn’t have to experience such tragedy. I’ll be sure to look for a good general dentist that would be able to give my kids the proper care they need the friendliest way possible. Thanks! I liked that you had mentioned that it can be important to visit a dentist twice a year to get cleanings and exams done. My wife and I haven’t been the best at going to the dentist and now she has a bad tooth pain that she’s dealing with. I’ll have to start looking around for a dentist that can help us out, and we’ll be sure to get checkups twice a year from now on. I agree that you would want to consider if a dentist has the right experience. Finding out what kind of procedures they usually do would be really helpful. I need a dentist for regular, twice-yearly cleanings, so I’ll have to find someone with experience to help out. Since my fiance and I moved into a new area, we have been looking into getting a dentist near us. We are trying to figure out what would make the perfect dental doctor. Both of us agree that a good one will have all the necessary qualifications. I like how you say that you would want to consider if a dentist can schedule your appointment around your schedule. Finding someone who is willing to accommodate you would be the ideal circumstance. My brother is looking for a dentist, so he’ll have to find someone who can fit his schedule. I like that you talked about choosing a dentist that has training with your specific issue. I have been looking for someone to do a root canal for me. I can see how it would be nice to find an experienced dentist because I wouldn’t have to worry about them making any serious mistakes. I agree that you want to find a dentist that is fully qualified to treat your particular dental issues. It would be smart to find someone who has experience with specific practices because that would ensure they are qualified. I’ve been looking for a dentist to perform a root canal ever since I moved, so I’ll have to find one that is qualified in this procedure to help me out. You make a great point when you say that you want to make an appointment to meet a dentist in person. Feeling out their personality would probably help you make a decision on whether or not you want to choose them. My son has some pretty crooked teeth and we’ve been looking for a dentist to help him with braces. When we find someone to help us out, we’ll have to meet with them in person first. My daughter and I have recently moved to a new area, and it’s coming time that we both need our biannual oral exams. Thanks for pointing out that you should make sure that the dentist you pick is able to do treat your dental issue whether it be a cavity or something else. My daughter is young, so she’ll probably end up with a few cavities. I’ll have to make sure to look for someone who can do that as I look for a dentist for the two of us. I appreciate your suggestion to look into dentists that are trustworthy. I like how you said that they should be experienced as well. My sister just moved and she is looking into a new dentist for her and her husband t visit. I’ll pass on your tips. I’m glad that you talked about finding a dentist that will help you feel confident about the procedure. My wife and I have been looking for a dentist after moving to a new area. It would be smart to choose someone that helps you feel confident because it’s easy for our kids to get nervous at the dentist. I like that you talked about choosing a dentist that has lots of training with what you need help with. My wife and I have been looking for a dentist after moving to a new area. It would be smart to choose a dentist that has done lots of fillings because our kids each need fillings done soon. I like that you talked about choosing a dentist that has experience with the problem you have. I have been looking for a dentist after moving to a new area. It would make sense to choose someone good at cavities because that’s what I have. I like that you talked about choosing a dentist that is qualified for the specific issue you have. I have been looking for a dentist after moving to a new area. It would be smart to choose someone good at fillings because that’s what I need right now. I’m glad that you mention how it’s important to choose a dentist who you trust and are comfortable around so that you won’t be worried about an appointment with them. In order to find one, you’d probably want to research the different options in your area and then meet with them. Meeting with them beforehand would give you the chance to ask questions and talk about your situation in order to make sure you’re comfortable around the dentist and will be able to get the dental care you want. I liked how you pointed out that choosing a dentist that can answer any questions you have is important. I personally think this would be an attribute I’d want to have in a dentist since being educated on what I can do to keep my teeth healthier would be hugely appreciated. I’ll definitely keep this in mind in the future.